Co-working spaces not only provide more available office spaces in prime areas, but they are also an economical option for work-spaces. 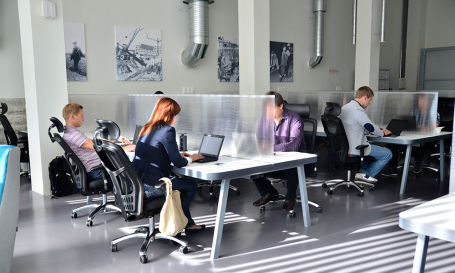 Co-working splits the cost of maintenance and utilities. Cost of air conditioning, WiFi and cleaning staff can be paid communally, thus cutting costs for each company. Coworking spaces not only benefit home based businesses but to all type of businesses, Freelancers, entrepreneurs, startups, employees of large corporations and remote workers all can get benefited. Coworking offers a motivational and Supportive environment. People get good opportunity to network with each other as the ecosystem of people, companies and industries are very diverse. Members can draw energy from one another and coworking colleagues thrive in a pressure-free setting. Coworking spaces contain a blend of individuals working on various functions of a business and also companies involved in various sectors. It gives good opportunity to form a nexus and individuals cultivate a sense of worth and relevance in the work they do. The flexibility of coworking spaces allows individuals to choose their own working hours, something that might not be possible in a typical office setting. Coworking not only benefits employees; employers have also realized that with less control of what an individual does with their time, they get better results. Hiring workers without the need to provide office space to them is not only cost effective but liberating. As both employees and employers warm up to this new way of getting work done, it is only a matter of time before the traditional office setting as we know it becomes obsolete. The Divine is a Co-working Space designed for startups, freelancers, consultants and independent professionals to work in a growth-ready environment. It offers workspace along with all the infrastructural facilities like wifi, conference room, tea/coffee, fully equipped pantry, relaxing zone, power back and much more..
Best of the class and standardized amenities in all of our facilities. We don't compromise on quality of service. All you need to do is come to office, work and enjoy our facilities..